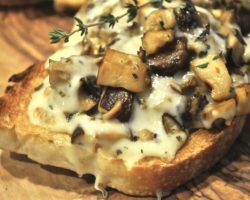 Looking for a delicious main course that’ll impress your guests, but is easy enough for an every day meal? 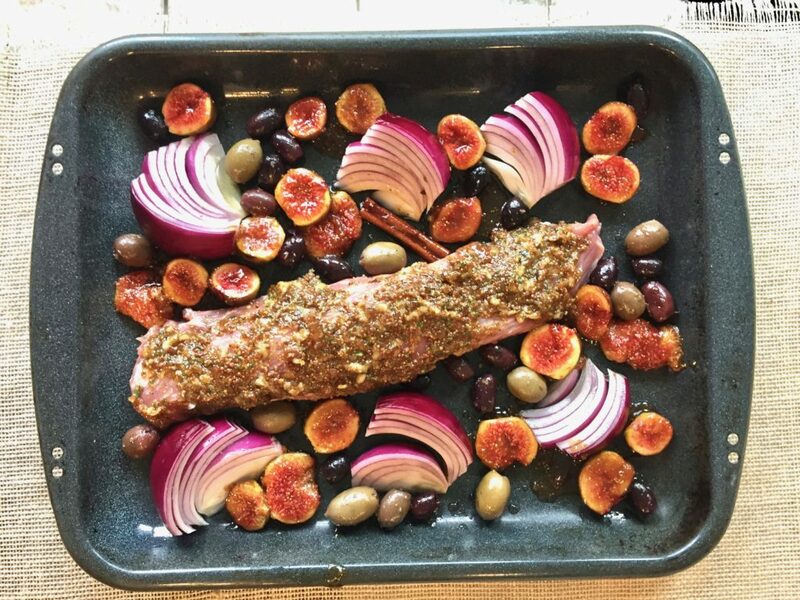 Look no further than this pork tenderloin roast, cooked with figs and olives, a recipe inspired by my friend, Marie, whose blog, Proud Italian Cook, always leaves me hungry. 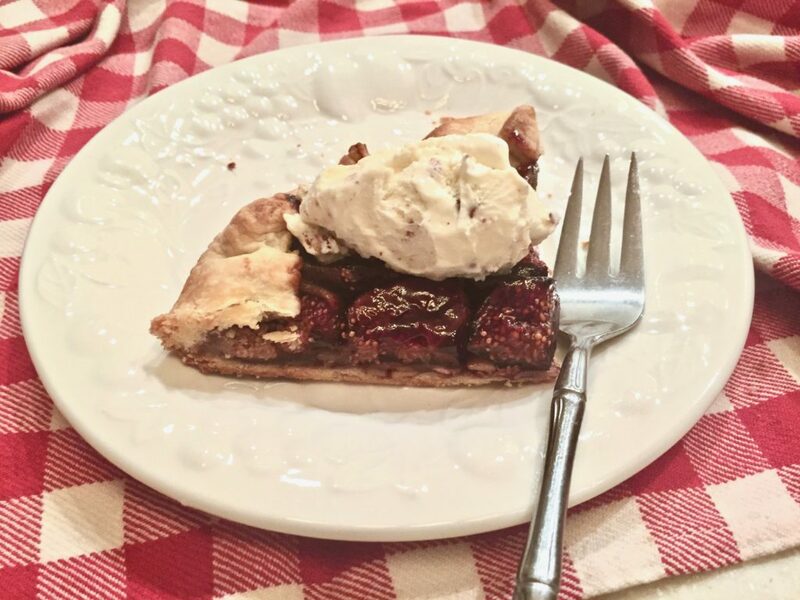 It’s near the end of fig season here in the Northeastern U.S., and if you don’t have your own fig tree, I hope you have FWF (friends with figs). My own fig tree, a new transplant that produced only one edible fig so far this year, was not up to the task, but fortunately I have a few FWFs, including my friend Dorothy, who invited me to help myself. 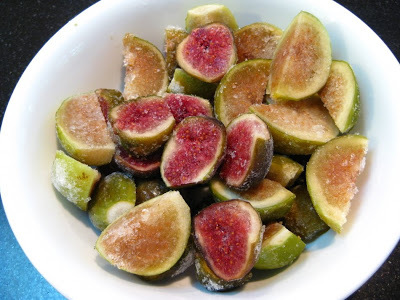 The recipe calls for some fig preserves, and fortunately, I still had some I made earlier in the year. 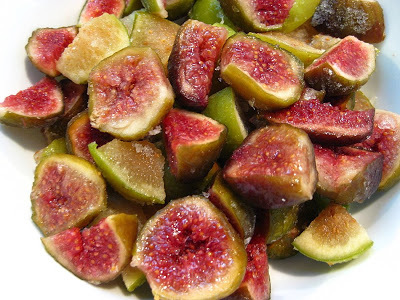 But you can easily purchase fig preserves from the store. I stewed them for a few minutes in port wine to soften them a bit. Careful not to cook them too long, or they’ll lose their shape since they cook further in the oven. 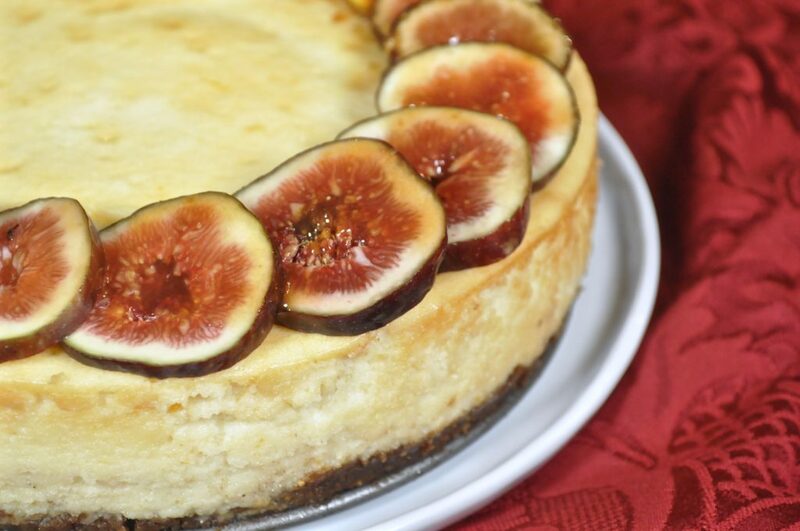 Port wine and figs are a match made in heaven, but if you haven’t got port, you can use red wine, or even just water if you don’t imbibe at all. Add a cinnamon stick to the liquid for even more flavor. 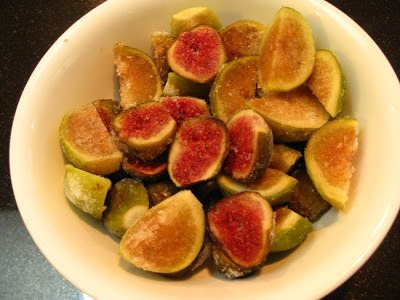 Make a paste of fig preserves, garlic and some herbs and spread it over the roast. 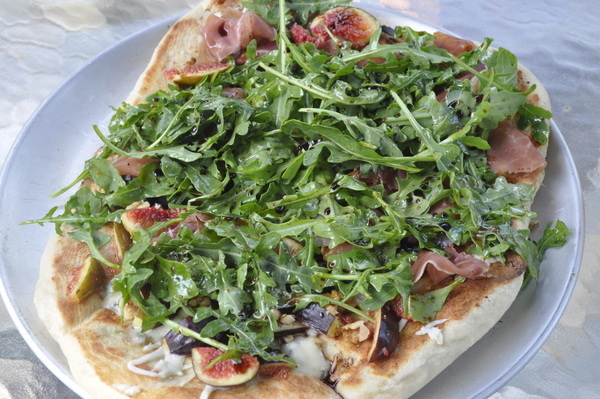 Surround it with the drained figs, scatter around some olives and sections of red onion. The first time I made this, I browned the meat, but much of the paste burned, causing me to scrape it all off. So I eliminated that browning procedure entirely the second time and it was delicious even without taking that step. 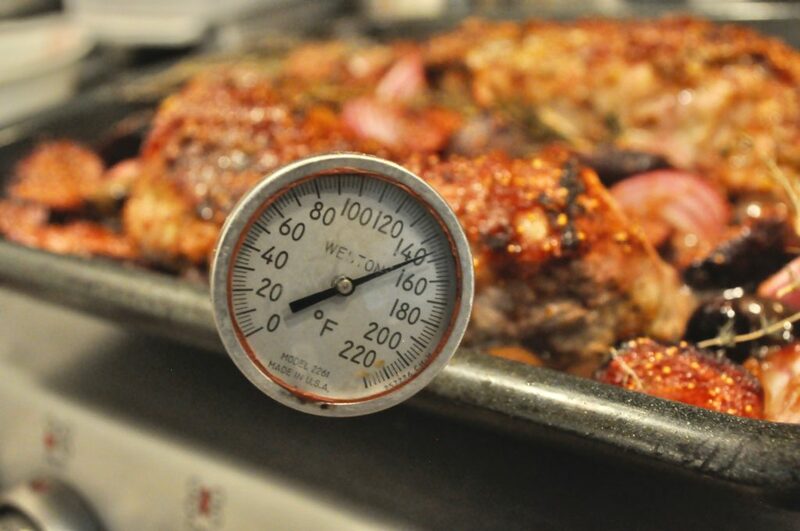 Roast it for about 20-30 minutes at 425 degrees, or until a thermometer reaches 145 degrees. 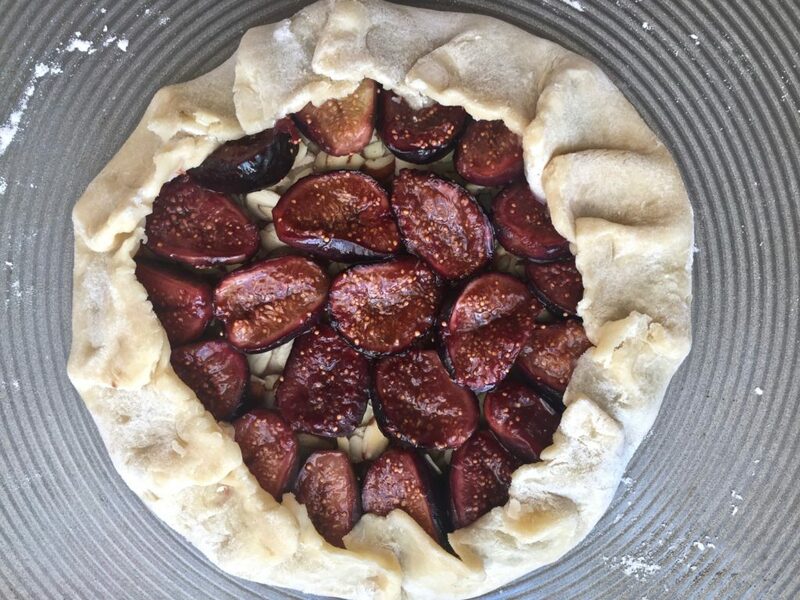 Let it rest for at least 5 – 10 minutes before slicing, then serve some of that luscious fig and port wine liquid on top. 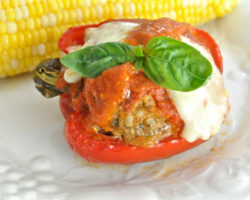 It’s so tender and flavorful you’ll go back for seconds…. and thirds. Pop over to my Instagram page here to see more of my food and travel adventures. Place the port wine, water, honey, fig preserves and cinnamon stick in a saucepan and bring to a boil. 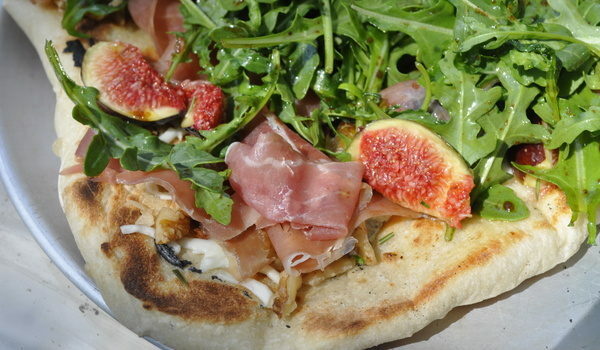 Reduce the heat, add the figs and poach gently for about five minutes to soften and imbue the figs with more flavor. Mix the marinade ingredients together and smear over the pork in the roasting pan. 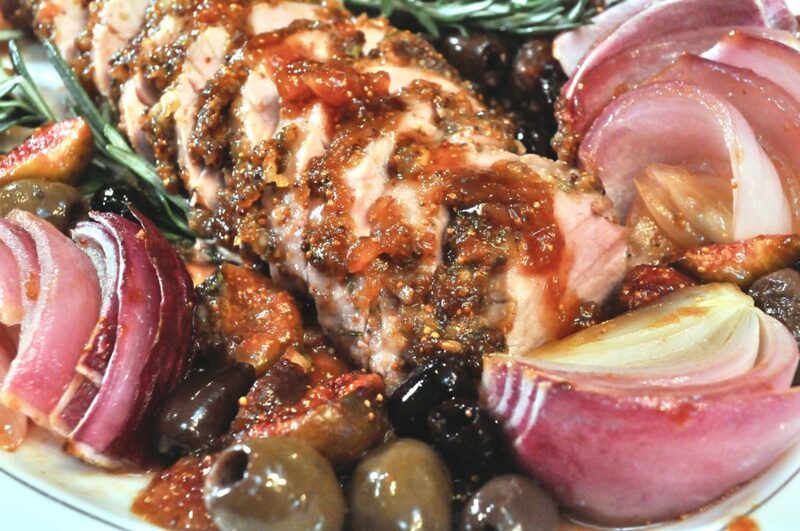 Let the pork sit at room temperature with the marinade for about ½ hour. 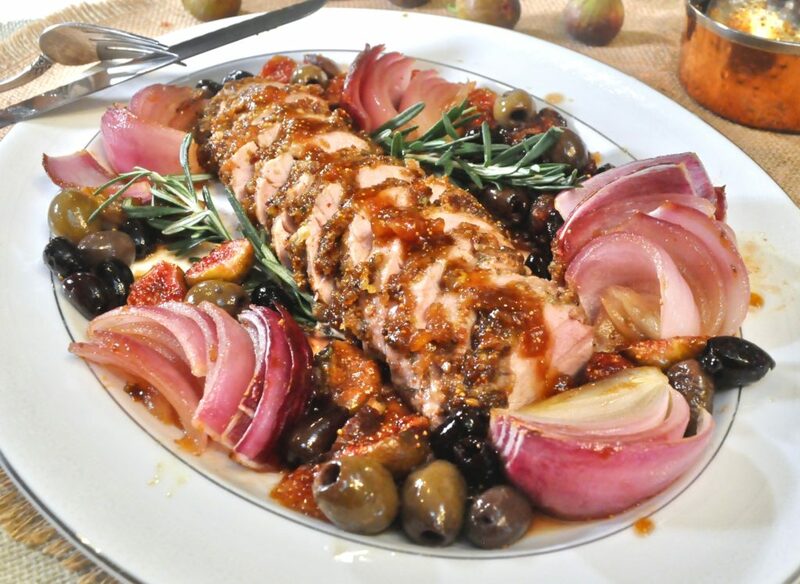 Fan out the onion sections around the pork, and also scatter the olives and drained figs in the pan. Spoon a little of the poaching liquid on the roast and place in a 425 degree oven for about 20-30 minutes or until a thermometer reads 145 degrees. Remove from the oven and cover with aluminum foil and let it rest 5-10 minutes. If the poaching liquid is not thick enough to your liking, reduce over high heat for a bit. Slice the roast and ladle some of the poaching liquid on top before serving. 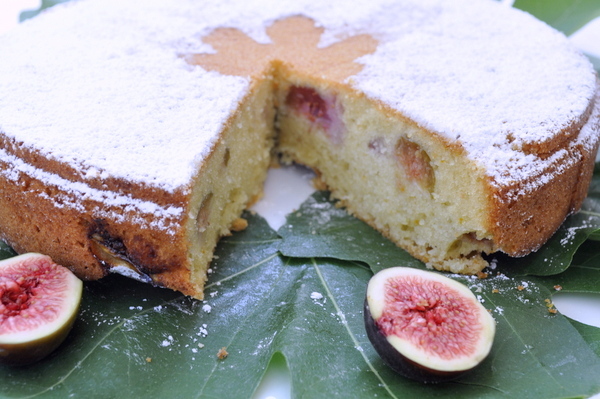 The figs in the cake were from my friend Ellie’s fig tree. I wish I could say they were from my yard. 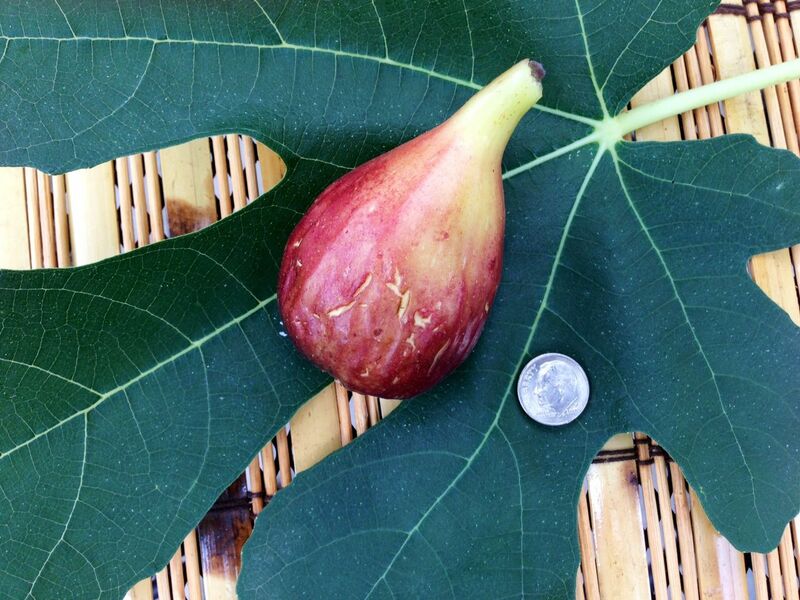 But the fig below is, in fact, from my very own fig tree. It’s the only ripe fruit I’ve harvested from it this year — and it’s a biggie. With any luck, the other figs will ripen before the frost hits. I’m keeping my fingers crossed. 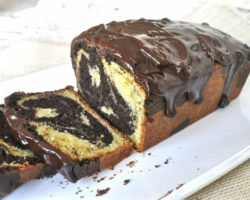 I used a cast iron skillet to make this cake. If you don’t own one, you should. They transmit heat so uniformly and they’re such versatile pans, you can cook anything from omelets to cakes in them. Plus they last forever. This one is 42 years old. Yikes, that sentence just gave me the willies. I have pans older than most of my readers? Oh well, at least I’m still here to write about it. moving on….. 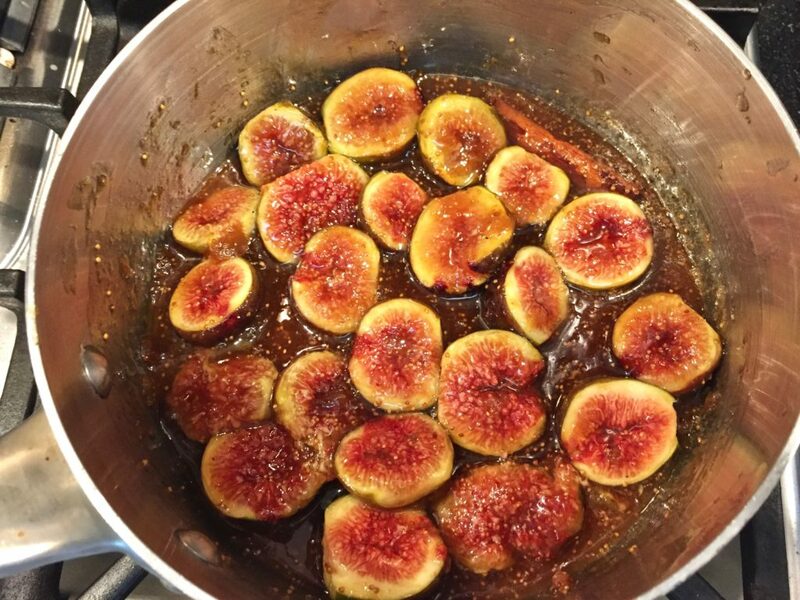 Melt the brown sugar and butter and place the figs cut side down. 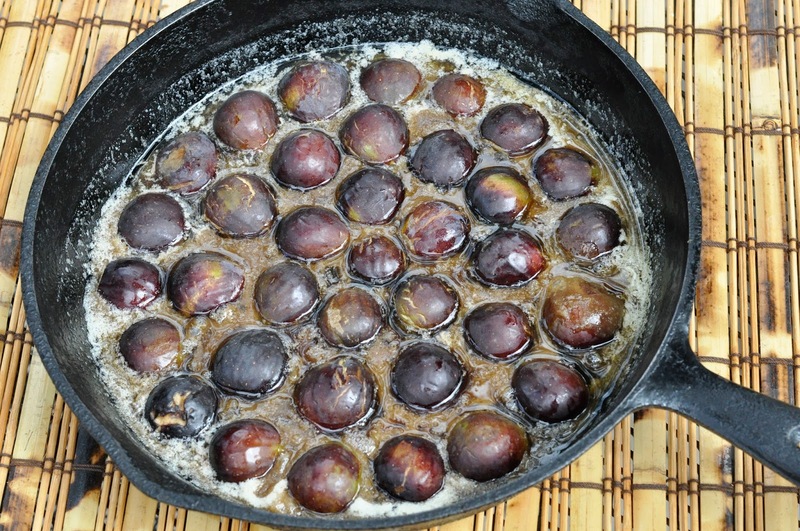 Mix the batter (it will be thick) and place it carefully over the figs. 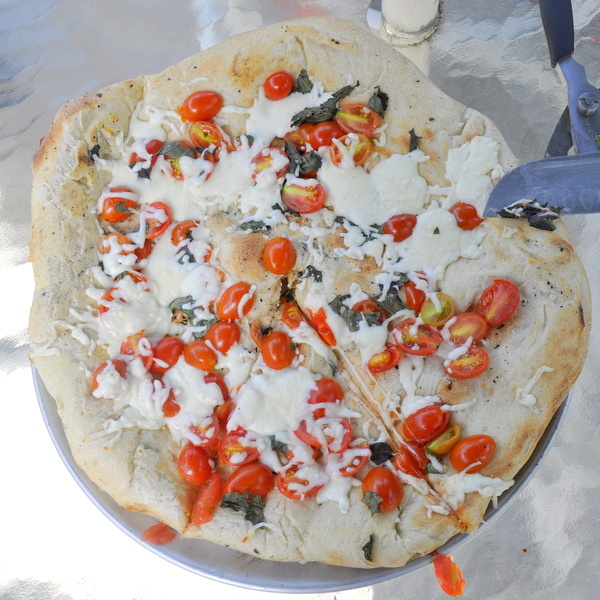 Bake at 350 degrees and flip it immediately (and carefully) onto a large plate. 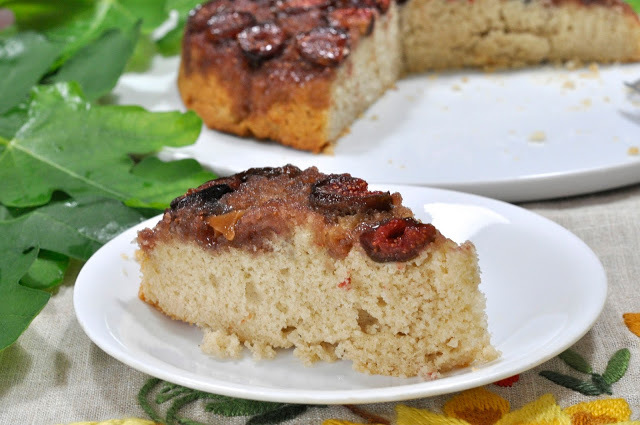 This cake is best enjoyed when warm, so gather some friends around and dig in. 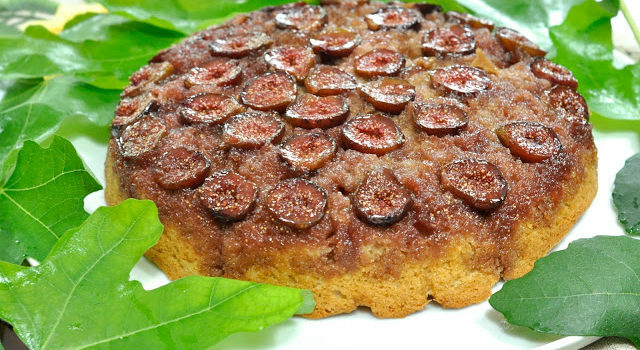 For another great version of a fig upside-down cake, check out Greg’s blog post on SippitySup here. 1/2 cup sugar + 2 T.
In a 10-inch cast iron skillet, melt the butter and brown sugar. 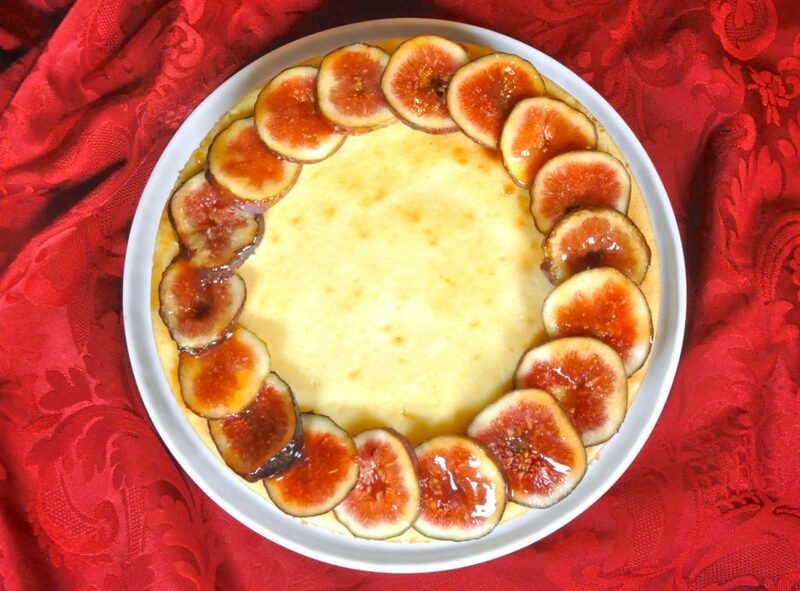 Arrange the fig halves over the sugar and butter, cut side down. For the cake batter, beat the butter and sugar until light. Beat in the eggs. Sift dry ingredients together. Beat half of dry ingredients into creamed mixture and beat in half of milk. Repeat, beating well. Batter will be thick. Pour into the pan over the fig/brown sugar/butter mixture. Bake in oven at 350 degrees for about 30-35 minutes. Serve warm if possible. I know, I know. 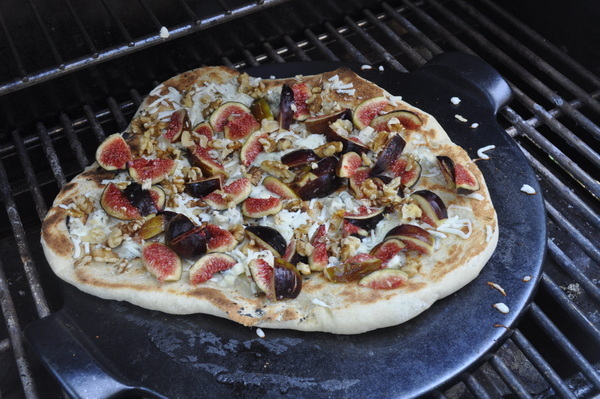 I just posted a grilled fig pizza, but figs are still in the market for a short time, and for those of you with fig trees, you may be up to your ears in these sensuous beauties and looking for ways other than fig pizza or fig jam to make use of them. This lemony olive oil cake will not disappoint. 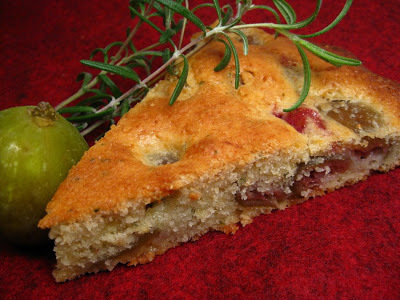 It’s the best version of an olive oil cake I’ve ever eaten (caveat – it does contain butter also). 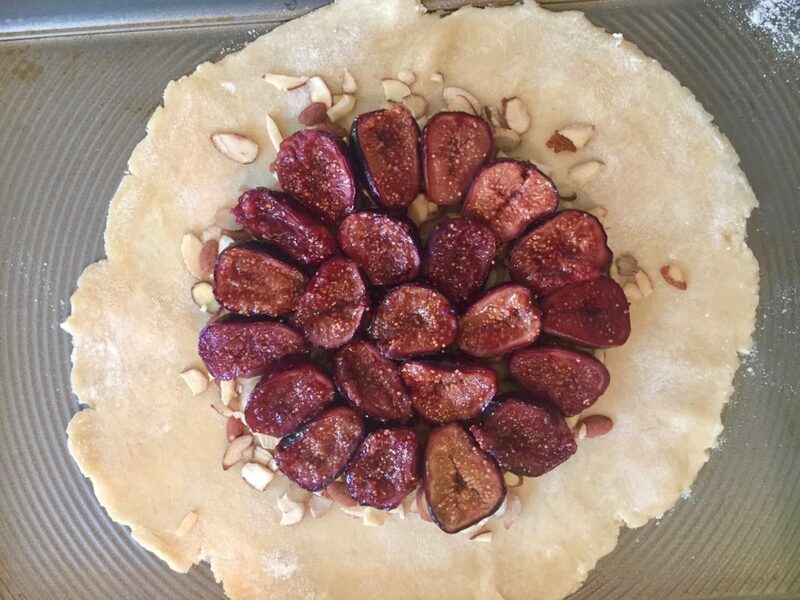 If you don’t have figs, use other fruit, like peaches, plums or apricots — even apples. 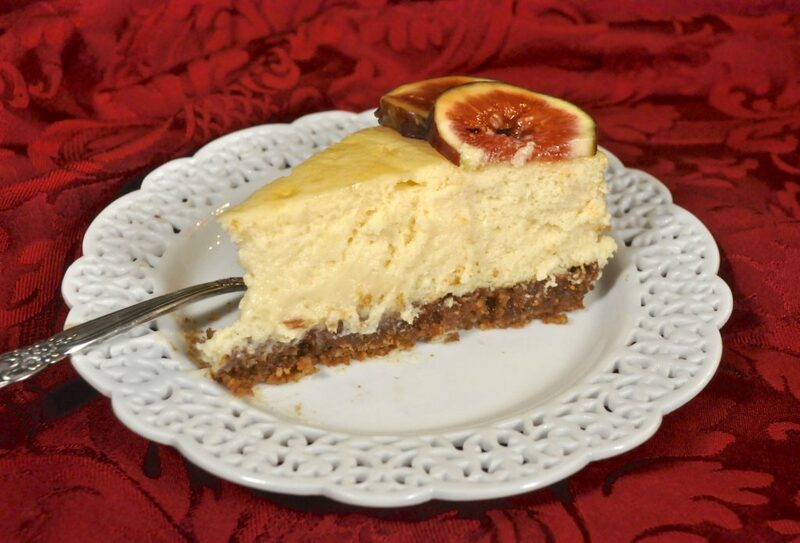 It has a tender crumb, a delicious citrusy flavor (boosted by a lemon olive oil sent to me by Nudo) and it’s easy to prepare. 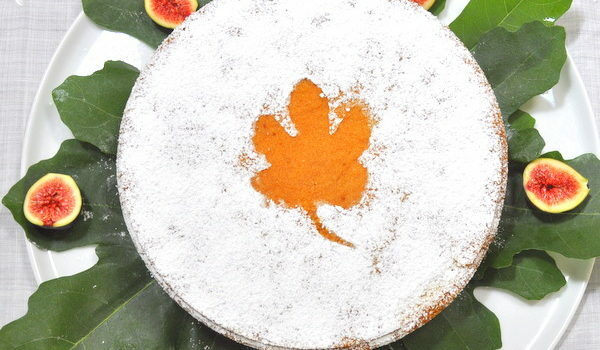 A sprinkling of powdered sugar on top (and a stencil of a fig leaf is nice too) is all the decoration you need. Pardon me while I get a little crazy on my “pop art” attempt. 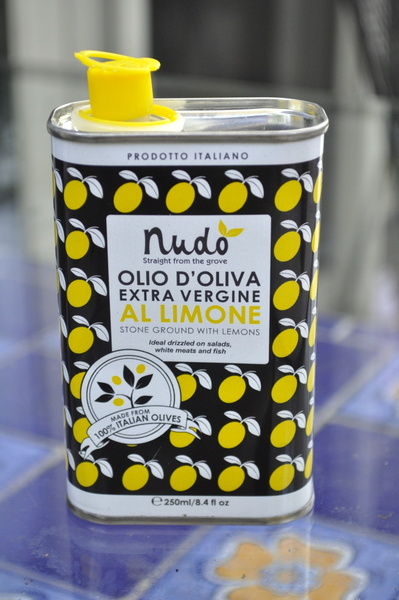 After making the cake, I wanted to see how that lemon olive oil would taste in a savory dish, without any cooking involved, but straight out of the tin. 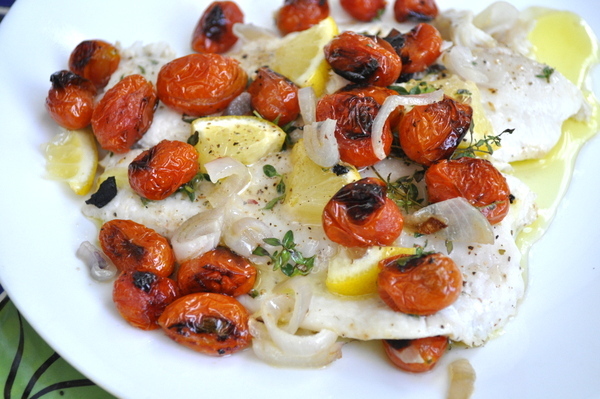 So I grilled some grape tomatoes on one part of the grill, while on the other side, I placed some flounder on a piece of tin foil that had been smeared with regular olive oil, not the Nudo al limone. I splashed the flounder with a bit of white wine, then seasoned it with salt, pepper, slices of shallot, lemon slices and bits of fresh thyme. I closed the lid for five minutes and came back to a perfectly cooked piece of flounder. I plated it, strewing the tomatoes around the fish and finished it with a healthy drizzle of the Nudo olio d’oliva al limone. 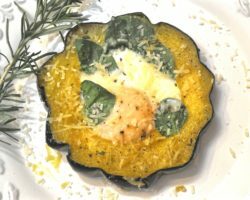 The fresh lemony flavor was evident in every bite and I think it’s the best possible use of this olive oil. The cake was delicious, don’t get me wrong. I plan to make it again and again. But with the lemon zest and citrus juice already in the cake recipe, I’m not sure the lemony olive oil really stands out. In this fish dish, however, the oil is a star. amounts were given in grams, and I find that method of baking much more accurate. But I’ve converted the measurements for U.S. cooks who don’t have a scale. 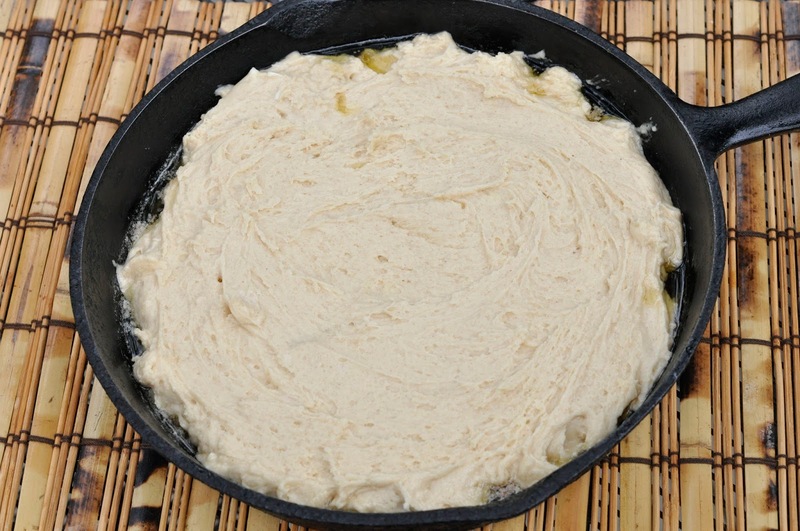 Pre-heat oven to 350° F. Butter and line the bottom of a 9″ cake pan with parchment paper. Combine lemon zest and sugar in a bowl, rub zest into the sugar to release essential oils—set aside. Combine melted butter, olive oil and lemon juice in a medium bowl. Sift together flour and baking powder. In the bowl of a stand mixer fitted with the whisk attachment, combine eggs, sugar mixture and salt. Beat at high speed until very pale yellow in color and has about doubled in volume. You are looking for the batter to hold a “ribbon”. With mixer still running slowly add oil mixture to egg mixture. You are slowly emulsifying the oil into the egg mixture. If you do this properly the mixture will not break. 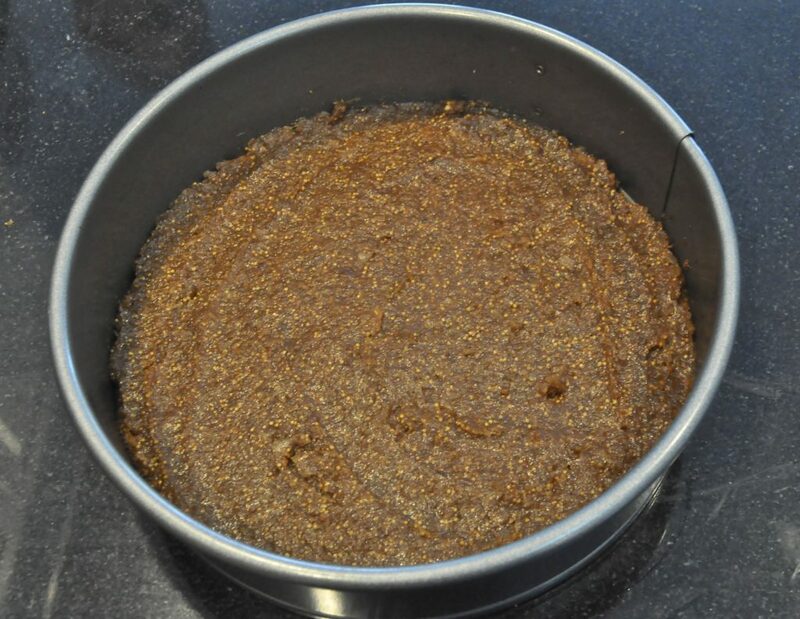 Remove the bowl from the stand mixture and fold in the dry ingredients, being careful not to over mix. 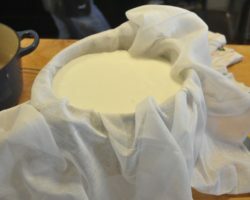 Pour about 2/3 of batter into bottom of the prepared cake pan. 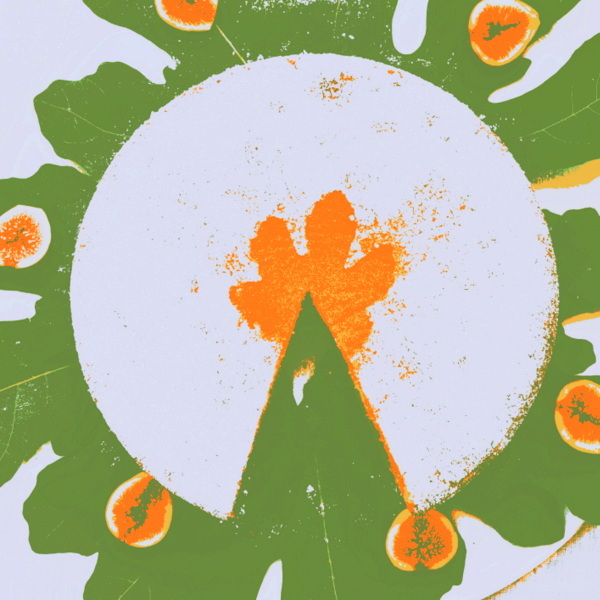 Sprinkle whatever fruit you are using on top. Cover with remaining batter and bake for approx. 35-40 minutes or until the cake is set. You can use a toothpick to test, it should come out clean. I like a sprinkle of confectioner’s sugar on top. Place some cherry or grape tomatoes on an aluminum foil container on the grill, into which you’ve smeared a little olive oil. Cook at high heat until they burst open and/or caramelize. On another burner, on low heat, place another aluminum foil container, onto which you’ve smeared a little olive oil. Place the filet of sole or flounder on the oil. Splash with a little white wine. Then strew the fish with sliced shallot, slices of lemon, sprinkle with salt, pepper and fresh thyme. Close the lid on the grill and check back in five minutes. The fish should be done or nearly done. 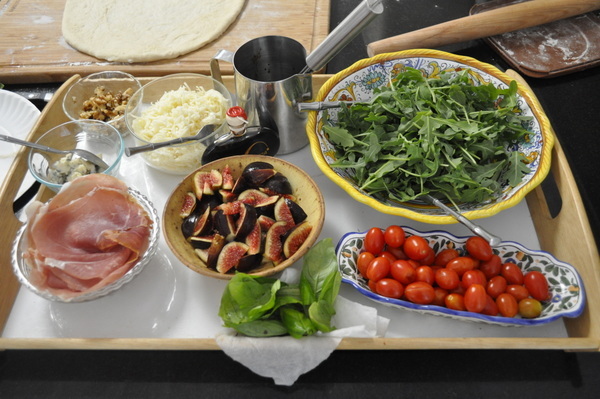 Remove to a place and scatter the tomatoes all around, then drizzle with the lemon-flavored olive oil. If you’ve ever eaten Chicken Marbella from “The Silver Palate Cookbook,” this recipe is somewhat similar in flavor, but with far fewer calories. It uses only two teaspoons of oil, rather than the 1/2 cup called for in the well-known recipe for Chicken Marbella. A few other things are different here. 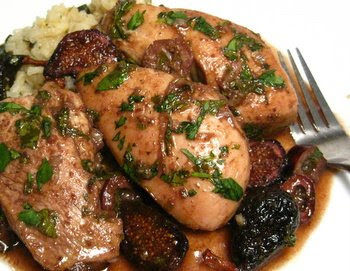 There’s cilantro, rather than parsley, balsamic vinegar instead of red wine vinegar, and most noteworthy – figs rather than prunes. 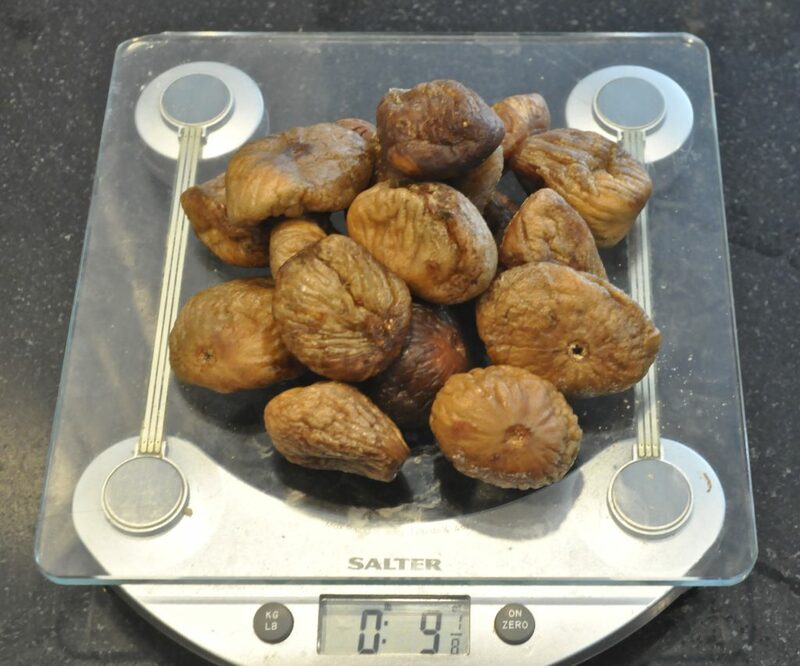 Unless you’re Stacey, from Stacey Snacks, (a real figaholic if ever I met one) the jury is still out on the figs. 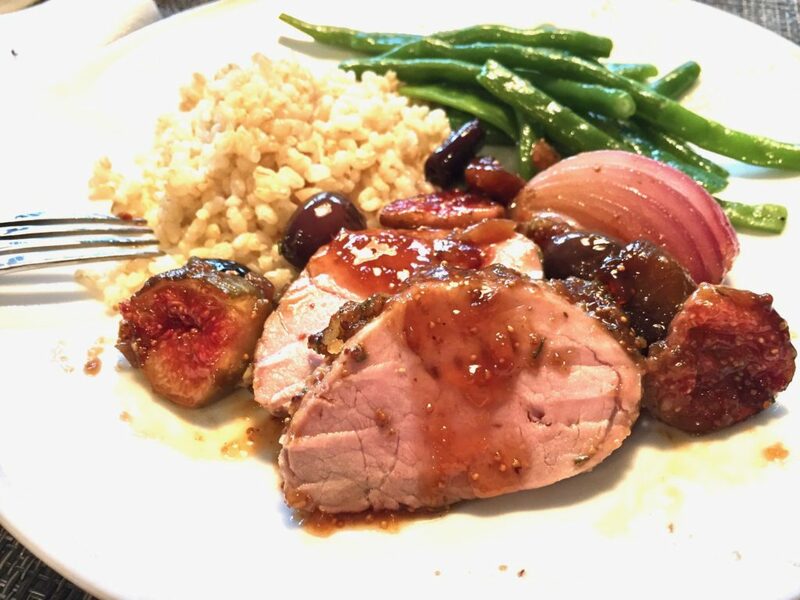 I think the prunes melt more into the sauce, lending a sweetness that the more sturdy figs don’t. But change is good sometimes. 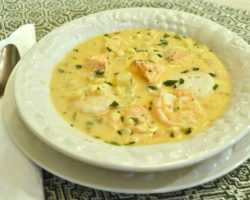 Both recipes are great for make-ahead meals, since they can be assembled and marinated ahead of time, then baked right before serving. I made this with boneless chicken breasts that weighed a total of about 1 1/4 pounds. It would easily have served three people. However, you can use as much as two pounds of chicken with the quantity of ingredients in the recipe below. 1. Combine all the ingredients in a zip-lock plastic bag, except the white wine and chicken broth. Let it marinate in the refrigerator at least four hours, turning bag occasionally. Leave it overnight if you want. 3. Remove chicken from bag. 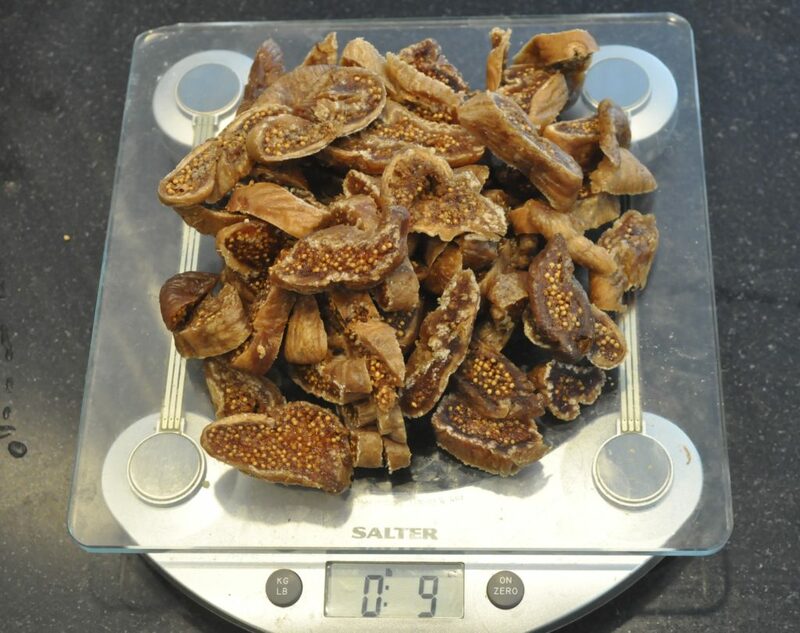 Place in a casserole or baking dish. Pour broth and wine over mixture and bake at 350 degrees for 30 minutes or until done. 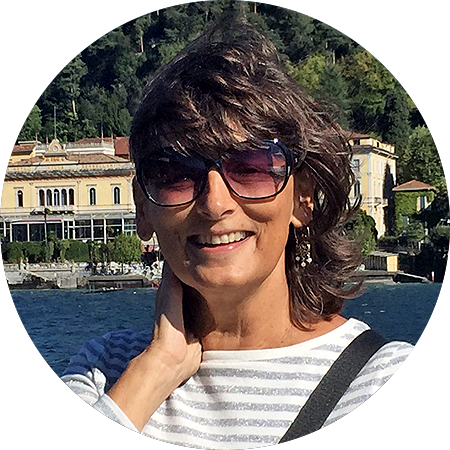 Most Italians living in the U.S., no matter how much they love their adopted country, yearn for the familiarity and beauty of the landscape in their native homeland. Who wouldn’t miss the majestic Alpine peaks, the sparkling Mediterranean Sea or the rolling Tuscan hills of the Italian peninsula? 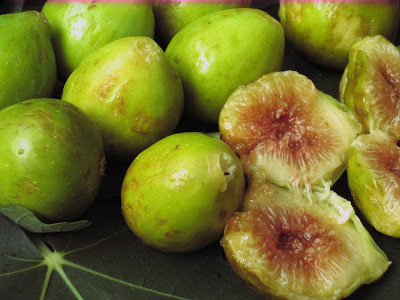 But so many of my Italian friends grow something in their gardens that evokes the Italy they know and love: a fig tree. Granted, they have to insulate it every winter to keep it from freezing. But the payoff is worth it. 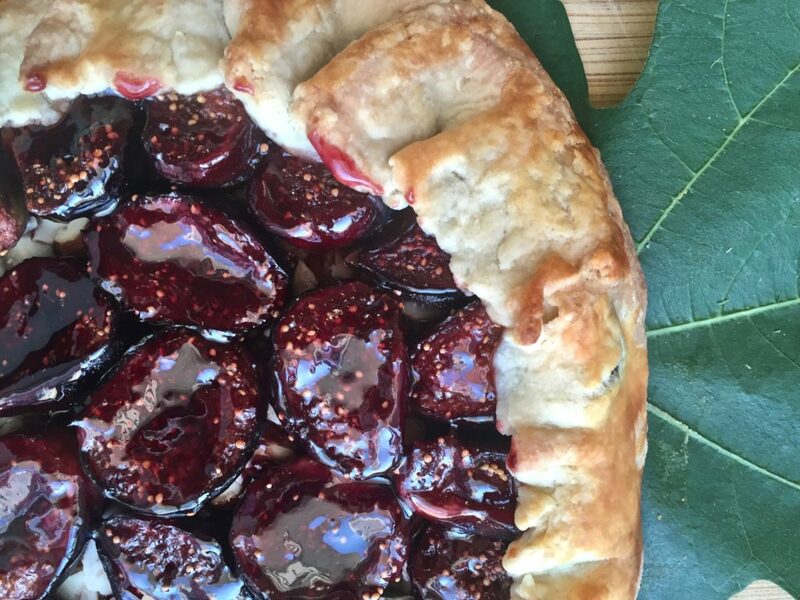 Come the end of summer, the trees produce succulent fruits that are hard to beat — perfect for eating out of hand or with a slice of prosciutto, and perfect for making jam that can be used as the filling in a crostata – or pastry tart. The pastry used in Italy — a “pasta frolla” — differs from American pastry due to its inclusion of egg yolks and sometimes a whole egg too. In mine I use only one egg yolk and a full stick of butter. It’s almost like a rich cookie dough. 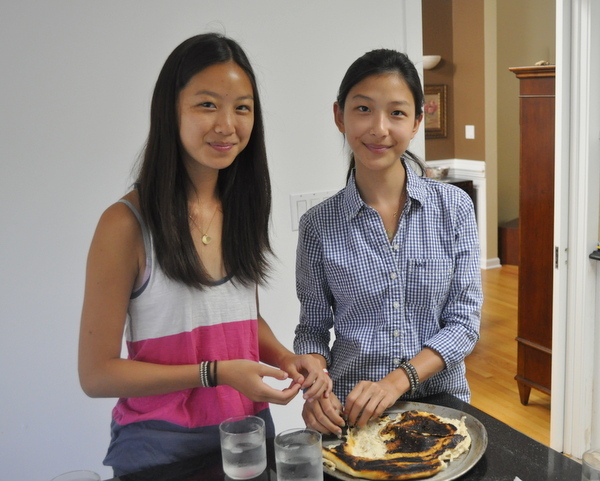 The trick is to handle the dough as little as possible so that the butter doesn’t completely assimilate into the dough. 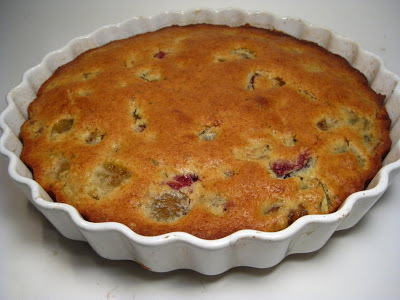 What you want are small bits of butter solids that will melt into the pastry as it bakes, giving it a tender bite rather than a tough crust. I mix it all in a food processor to avoid excessive handling. 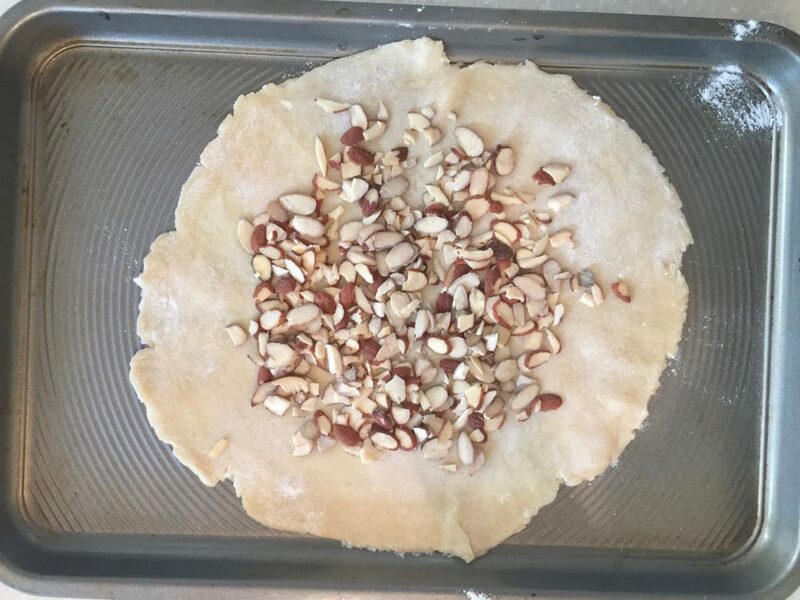 The recipe is for a 9 or 10 inch tart pan with a removable bottom plate, but if you have a larger tart pan, you can easily make 1 1/2 times the recipe for the dough and add more jam as well. 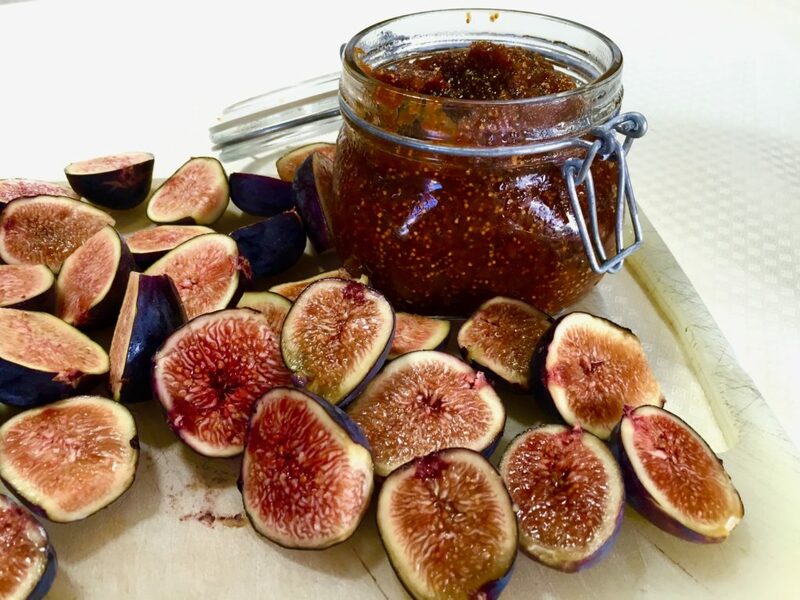 If you don’t have homemade fig jam, you can purchase it in jars in specialty shops and even some supermarkets. 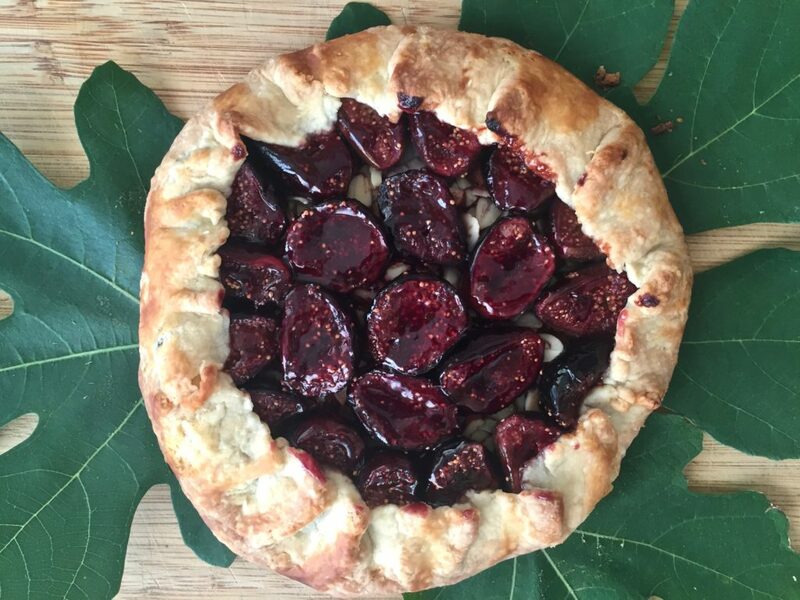 If figs are not your thing, crostata can be made with any kind of jam. 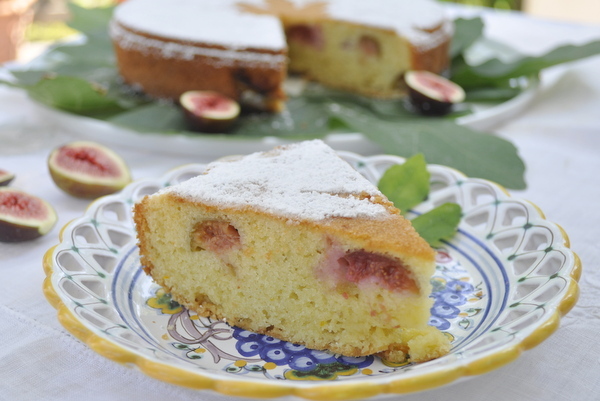 The ones most commonly found in Italy are made with either plum or apricot jam. Place flour, sugar and baking powder into food processor and pulse for a few seconds. Add the butter in small pieces and pulse again, along with the lemon peel, until it resembles coarse sand. Beat the egg yolk slightly with the water and add to the food processor, pulsing until the mixture starts to form a ball. Add more water, a teaspoon at a time, if necessary. 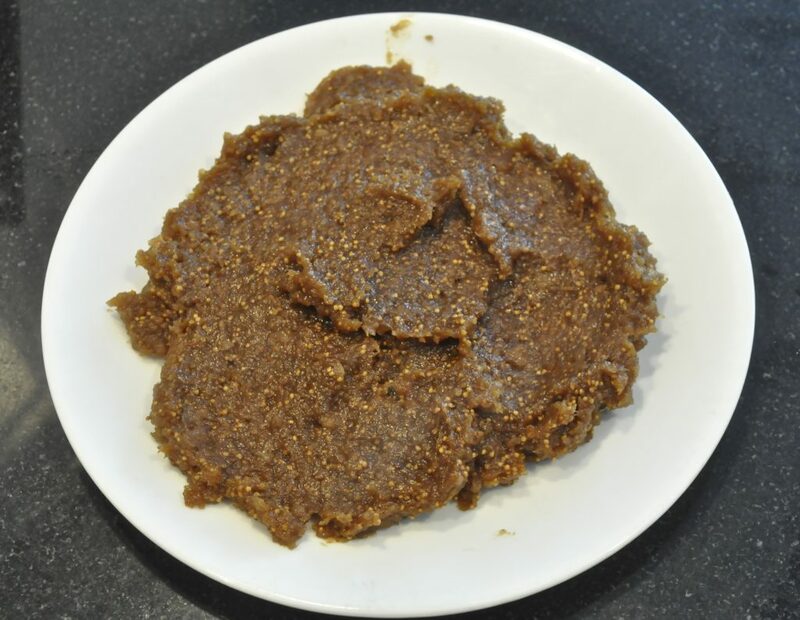 Remove from food processor and refrigerate for at least a half hour. Divide the dough into 2/3 for the bottom and 1/3 for the strips. 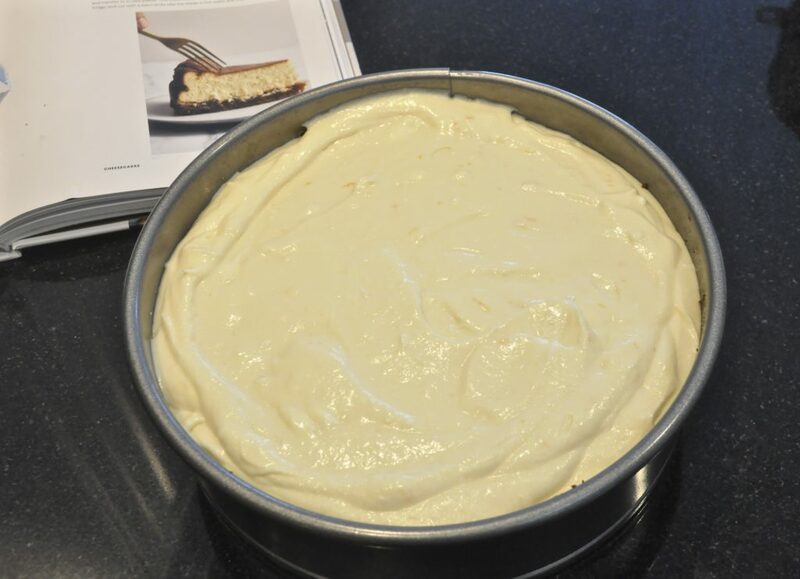 Roll the bottom onto a floured surface and fit it into a buttered tart pan, letting any excess hang over the edge. Fill the crust with jam. Roll the remaining 1/3 of the dough on a floured surface and cut into strips. 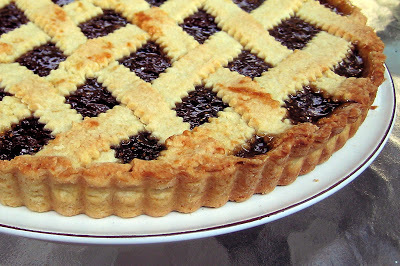 Place them lattice-fashion over the jam, attach them to the dough along the rim, then trim the edges of the crostata. 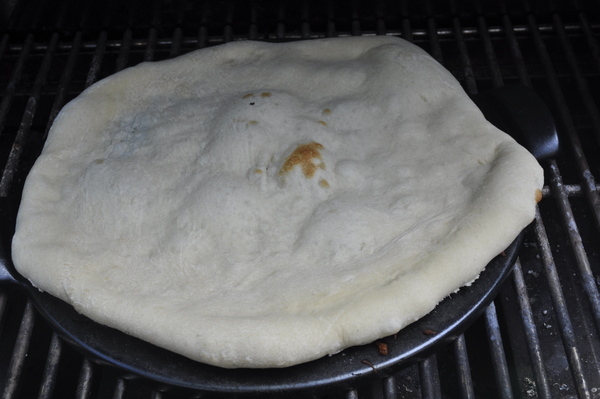 Bake in a 375 degree oven for about 25 to 30 minutes until the dough is golden brown.